*This concludes my three-part special. If you happened to miss the first two, here they are: Part 1 and Part 2. In Allie’s first SCUBAPS expedition to the surface, I wanted her to encounter creatures of the deep. I purposely selected fish not widely known, which is why I left out the anglerfish as more than a passerby. Anyone who has seen Finding Nemo knows exactly what an anglerfish looks like and its behavior. Instead, I choose the fangtooth fish, viperfish, gulper eel, lanternfish, hatchetfish, and sixgill sharks to highlight. Due to the crushing depths of the ocean, many of these fish are smaller than you may realize. All but two of the creatures could fit in a grown human male’s hand. In the subsequent paragraphs, I’m going to give you basic information on each of the species. Some of them have been known to science for a while, but due to the distance from the surface, they haven’t been well researched. If you wish to find out more information than what I’ve outlined here, see my references section for further reading. 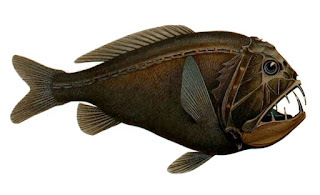 The fangtooth fish (Anoplogaster cornuta) is brown or black in coloration(3) and only around 16cm (6in) long(1).Their natural habitat range is temperate and tropical seas around the world(2) at depths of 2,000 to 5,000m (6,500 to 12,500ft)(1). Their most identifying feature are probably their fearsome jaws, which are used to ensure successful capture of prey, thus making it difficult for their meal to escape. Fish and crustaceans make up their diet, which they devour by sucking them into their mouths(2). Unlike the anglerfish, fangtooths don’t wait around for their food but instead are active predators. Large jaws reduce gape limitation, allowing them to catch a variety of food. They also don’t exhibit bioluminescence or the bright color of some other deep-sea fish(3). Not much else is currently known about them. If you’d like to see a picture of a live specimen, click here to go to National Geographic’s Deep-Sea Creatures gallery. 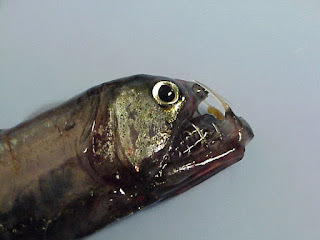 The pacific viperfish (Chauliodis macouni) is nearly three-fourths larger than the fangtooth fish, reaching lengths of 25-30cm (9.8-11.8in) long(1)(6). They can live as deep as 4,400m (13,000ft), which is deeper than the city of Oceania. Unlike the fangtooth fish, they use bioluminescence to attract food. The light comes from photophores (light producing organs) on the ventral (bottom) part of their bodies(1). Like gulper eels, viperfish have elongated bodies along with elastic stomachs that have the ability to stretch, allowing for large meals to be ingested. On the outside lining of their stomach, they have an extra thick layer of tissue that shields their stomach contents from the outside would. It keeps predators from seeing through their translucent skin to the bioluminescent prey the viperfish ingests (6). If you’d like to see another picture, click here to go to National Geographic’s Deep-Sea Creatures gallery. Gulper eels (Eurypharynx pelecanoides) are one of the elongated body shapes that Allie describes seeing amongst the other creatures of the deep. Instead of scales, they have black velvet-like skin(10), small teeth, and little eyes. They are typically found from 500 to 3,000m (1,640 to 9,843ft)(9). This species is also referred to as pelican eels due to their gaping mouths. Their hinged-jaws can expand to accommodate meals as large as basketballs. The bioluminescence they possess is located at the end of their tail, which they use to attract prey(6). They eat mainly crustaceans, but also fish and invertebrates. Any excess water that is gulped down along with its meal is sent through its gill openings(9). One of the larger creatures Allie encounters, they typically grow to 60cm (23.6in) (6), but some have been found to grow to 1.8m (6ft) long (8). If you would like to see a photograph of one, click here. If you’d like to see a video of a live specimen, click here to go to Arkive.org. There are several different species of lanternfish but the one Allie encounters is the smallfin lanternfish (Stenobrachius leucopsarus) also known as the Northern lampfish. They grow to about 12cm (5in) long and range between depths of 700 – 1,000m (2,297-3,281ft). They, too, exhibit bioluminescence, with photophores located laterally and ventrally on their bodies. Each species of lanternfish have their own particular patterns of light. Their diets consist of invertebrates such as shrimp, copepods, and amphipods(11). Like many species of fish, their larvae grow up as zooplankton, floating in the water column eating phytoplankton as they grow. The adults are diurnal, which means they move up in the water column to feed during the day and go down to the depths at night for safety(12). If you want to see a great picture of one, click here to see the image on the Monterrey Bay Aquarium website. The hatchetfish (Sternoptyx obscura) is a fascinating creature. Their bodies are laterally compressed, making them appear as if they are slender-shaped from below. The smallest creature Allie sees with the Sea-vision, they only grow to be 8cm (3in) long and live between 399-1,259m (1,310-4,130ft) below sea level(7). They exhibit bioluminescence, but instead of it being used to attract prey, it is used for camouflage. The photophores on the bottom of the fish mimic the light reflecting from the surface, so that it effectively obscures its outline, making it difficult for predators to find it(6). Just like the lanternfish, the patterns of light vary based on the different species of hatchetfish(7). The last creature of the deep that I’m focusing on is also the largest creature Allie encounters (if you don’t count the fake monster). 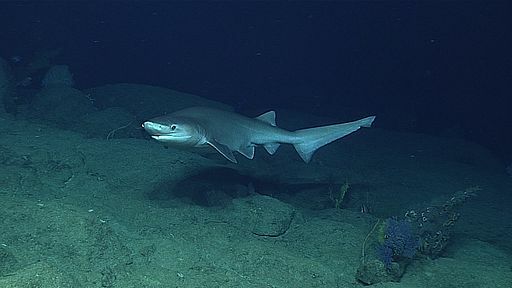 The sixgill sharks that appear in the novel are called bluntnose sixgill sharks (Hexanchus griseus)(4). Allie severely misjudges the size of sixgills in the novel since they typically grow to 3.5-4.8m (11.5-15.7ft) long and can weigh between 480-720kg (1,058-1,587lb). They have a dorsal coloration that is usually a grayish black or brown with a whitish underbelly(5). Bluntnose sixgill sharks are known to dive as deep as 2,500m (8,200ft)(1). During the night, they travel up to shallower depths to feed on fish, crustaceans, and sometimes mammals. They are harmless to people and like many deep-sea fish, are both curious and hesitant to check out anything new that comes into their area in the event that it may be edible. As for conservation, the IUCN has listed them as Near Threatened, which isn’t necessarily good. They are ovoviviparous, which means that the embryos hatch inside of the mother and she then gives birth to live young. Like some other species of sharks, bluntnose sixgills exhibit oviphagy behavior, which means that shark embryos will eat each other until only a small portion of the original litter remains. Luckily, the litters contain between 22-108 pups(4). Current research indicates that they may be able to live up to 80 years, but like the other deep-sea creatures, information on them is limited(5). If you’d like to see another picture of one, click here to go to National Geographic’s Deep-Sea Creatures gallery. The deep-sea is like a terrestrial desert. At first sight, it appears devoid of life. Upon further inspection, there’s life all around if you only take the time to look. Allie’s deep-sea encounters could have happened to any deep-sea explorer (and they have if you look up some of the real-world underwater expeditions to the abyss). Hopefully, someday soon there will be even more information on the species highlighted here as well as new discoveries made. The deep-sea is so vast that new species are discovered in almost every dive to the abyss. Microscopic life was even found at the bottom of Challenger Deep in the Mariana Trench(13). Who knows what else is out there. This concludes my three-part special on the sea creatures featured in my novel. From here on, the blog posts will be bi-weekly (twice a month). If you have any questions or comments about this blog post, leave me a comment below or email me at elizataye@gmail.com. As always, I love hearing from my readers. (6) Gilpin, Daniel. “The Deep.” Spirit of the Ocean: Discover the Beauty of Our Underwater World. Bath: Parragon, 2007. 182-91. Print.